The Vent Sizing Package 2™ (VSP2™) is a low thermal inertia adiabatic calorimeter used for process hazard characterization that utilizes state-of-the-art DIERS technology to obtain critical upset process design data. It is the commercial version of the original DIERS bench scale apparatus developed by Fauske & Associates, LLC's (FAI). Its versatile design allows the VSP2™ to simulate upset (abnormal) conditions which might lead to a runaway chemical reaction (e.g. loss of cooling, loss of stirring, mischarge of reagents, mass-loaded upset, batch contamination, fire exposure heating, etc). Resulting temperature and pressure rise rates are directly scalable since it is a low thermal inertia (phi-factor) apparatus. FAI not only utilizes the VSP2™ in our fully equipped hazards laboratory but we also manufacture and sell the calorimeter for use by our clients. The VSP2™ utilizes established DIERS technology to identify and quantify process safety hazards so they can be prevented or accommodated by process design. Test data includes adiabatic rates of temperature and pressure change which, due to the low thermal inertia, can be directly applied to process scale to determine relief vent sizes, quench tank designs and other relief system design parameters related to process safety management. Adiabatic data obtained with the VSP2™ can be used to characterize reactive chemical and consequences that could occur due to process upset conditions. 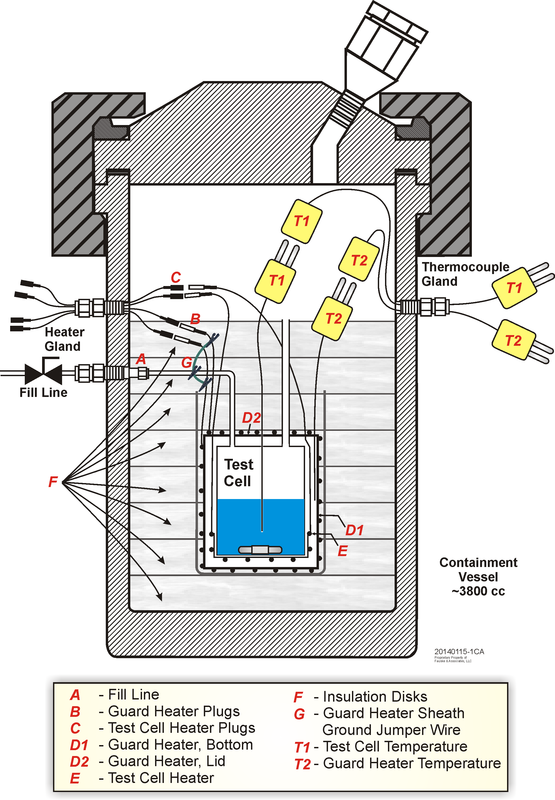 To get the best temperature readings from VSP2™ tests, it is important to remember to ground the sheath of each element of the guard heater to the test cell fill line as shown in Figure 1. Both the sheath of the lid and side elements of the guard heater should be jumpered using alligator clips to the test cell fill line. This eliminates electrical interference from the heaters with the test cell thermocouple. In addition (as per the VSP2™ Manual), the containment vessel should be grounded to the VSP2™ control box chassis. Finally, the shields of the thermocouple cables where they plug in to the thermocouple gland should also be grounded to the outside of the containment vessel. These measures help assure noise free temperature measurements. If the FAI Super Magnetic stirrer is being used, the thermocouple cables should be oriented radially away from the containment vessel and kept above the Super Magnetic Stirrer. This avoids interference from the strong magnetic field of the stirrer. FAI also created PrEVent software to allow users to implement practical emergency vent sizing using industry recognized methodology. It applies DIERS methodology (including the Leung-Omega and Fauske methods) for reactive chemistry and API 520/2000 or NFPA 30 for non-reactive systems. For more information on the VSP2 or Adiabatic Calorimetry and Relief System Design, please contact Jeff Griffin at griffin@fauske.com or 630-887-5278. www.fauske.com.